His primary field of interest is sports medicine and joint preservation in the active patient. 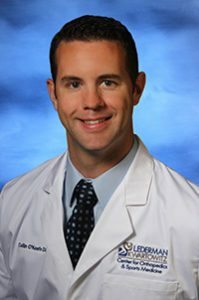 He is fellowship trained in orthopedic sports medicine, with experience in knee and shoulder arthroscopy, trauma care and fractures, and osteoarthritis and joint replacement. As Michigan natives, Dr. O’Keefe and his wife chose to remain in the metro Detroit area to be close to both sides of their family. When he’s not working, he’s most often with his wife and two daughters. As a third generation graduate of Notre Dame, Dr. O’Keefe is passionate about Fighting Irish football and also enjoys playing golf with friends.